Up next is the 3rd Brunswick line. They fielded 691 men under Major Von Normann at Waterloo. Again these are Perry figures, but this time primed black with subsequent dry brushing of Dark Prussian Blue followed by London Grey, both from the VMC range. My airbrush compressor broke, so no black ink this time. Here we can see the detail on the superb Flagdude standards, just fantastic. Hard to obtain, but well worth the effort. I have painted 7 units of Brunswick to date and these are the first unit to get a standard, I had to be patient. I was particularly looking forward to painting this line unit as they have white facings, beautiful combination black and white! 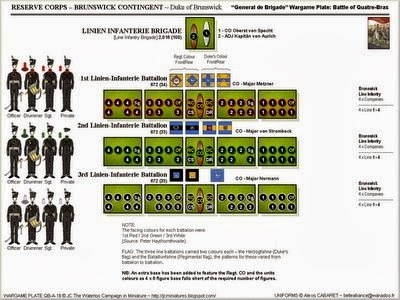 There is a bit of a fly in the ointment, I suspect now that all the figures in my Brunswick Corps are re-casts. I just feel awful about this, not because they are poor figures (they are actually fine), but more so because I feel I have cheated the Perry brothers. I bought them off TMP, I suspect the individual, who went by the nom de cheat of Warmbeaches, sold thousands of Perry, Front Rank and Calpe recasts. This was discovered about a year ago if I remember correctly. I suppose there is not much I could do as I had already painted 6 units, that is a lot of work, I just could not throw them in the bin. So after thinking about it for several months, I have decided to paint the last 3 units. As it is, I have only 24 more Brunswick recasts left so I need to order 24 more to complete the Corps, these will come directly from the Perry's. Damn your eyes Warmbeaches. Anyway enough of that, I am off to Montreal today, playing a game of Lasalle on Friday, looking much forward to it. Great paintjob and wonderful flags too! Recasts or not they look excellent as always. These are good. My favourite part of this group is the two flags. Brilliant job there. Very smart, nice work indeed. Great looking figures, I suppose you weren't to know they were recastes when you bought them so don't beat yourself up about it. So where's Will Smith then???? Great looking figs - buy a few more figs from the Perry's directly and you'll feel better - I know I always do! Your new technique worked very well on the MIB, and the Flagdude flags really complete the unit brilliantly! Re: re-casts... not much you can do there, aside from buying more lead form the real McCoy. I cannot understand what would cause someone to pirate the work of another for profit. Surely there is no grey zone there - pure theft! Nice figures. Balck uniforms are a nightmare to paint! Wonderful work, John. I hope you have a great time in Montreal! Lovely painting. Those standard bearers must be 'fit' fellas!